Rabbi Raina Siroty, right, with Rabbi Karen Fox and Rabbi Sally Preisand at Siroty’s ordination on May 14. While many smaller Jewish communities aren’t able to support both a rabbi and a cantor, Alexandria’s Gemiluth Chassodim is getting both — in one individual. Rabbi Raina Siroty was ordained as a cantor before going back to school to become a rabbi as well. She begins at the central Louisiana congregation this month. Though raised in Los Angeles, Siroty was actually born in Georgia, where her father was working for the Allman Brothers band. One of her earliest memories is leading the blessings over challah and grape juice at Sunday School at age four. While she enjoyed Sunday School, after two years she would have to drop out as her then-single mother could not afford dues. “For years to come, I would watch my friends who had the privilege of attending religious school, hoping one day to join them,” she said. The spark had been re-kindled. “Hillel was transformative in showing me the real tenets of Judaism, and being surrounded by people celebrating Shabbat,” she said. A Birthright trip made that desire even stronger, and she began to research her three-times-great-uncle, Hazzan Gershon Sirota, known as the “Jewish Caruso” and one of the leading cantors in Europe’s “golden age” of hazzanut. He died at age 69 in the Warsaw Ghetto Uprising. “It was through learning about his life that my passion for singing, my love of Judaism and God, and a legacy to honor and continue the life’s work of Gershon Sirota had all come together,” she said. She graduated with a Bachelor of Music Degree in voice performance with highest honors from the University of California in Santa Barbara, then enrolled in the cantorial program at Hebrew Union College-Jewish Institute of Religion, becoming ordained in 2010. From 2010 to 2012 she served as cantor of Shomer Emunim in Toledo, Ohio. When the rabbi was away, she was the sole clergy, and during one such time the child of a congregant died. She noted it was “a tragic and difficult time for the most seasoned professional,” and she felt inadequately trained to handle it. 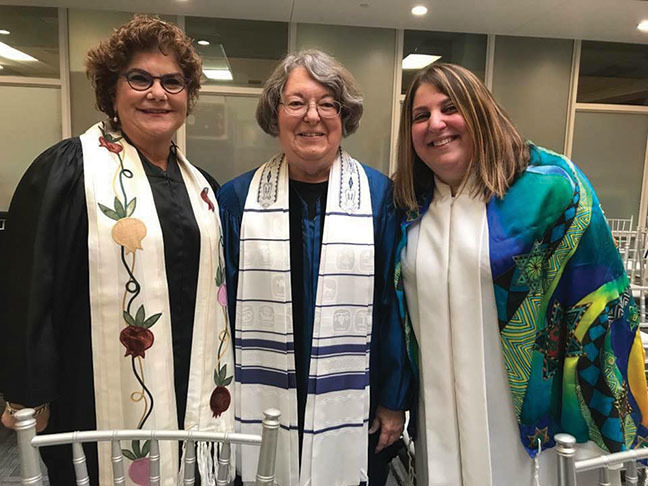 “I realized I wanted to be able to help the Jewish community in all areas — in pastoral care, being able to help them with all life cycle events, and really be a more well-rounded clergy person,” she said, so in 2012 she headed back to HUC to become a rabbi, and was ordained in May. While attending rabbinical school, Siroty interned as a chaplain at Cedars Sinai Medical Center, served Temple Kol Tikvah in Woodland Hills, Calif. as a rabbinic intern and as an auxiliary cantor at Temple Isaiah in Los Angeles. She said the participation was “exciting to see, that they take ownership and interest in their Jewish identity.” That level of participation is often missing in congregations, she added. Also furthering her Southern journey was a class she took with Gary Zola, executive director of the American Jewish Archives, when he was on sabbatical at the College of Charleston. The course, on Southern Jewish history, fascinated Siroty, from the influence Southern Jews had on their communities to the number of multi-generational families that have remained in their communities.